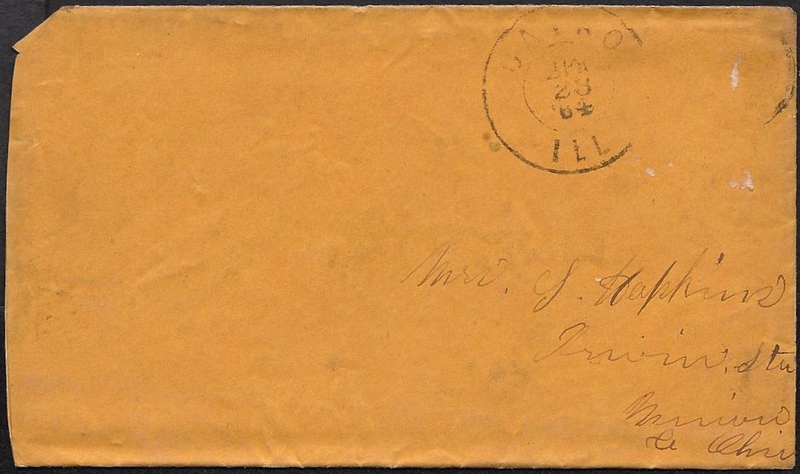 These five letters were written by Francis Marion Hopkins (1844-1928) of Co. B, 32nd Ohio Infantry. Marion enlisted as a private in August 1861 for three years. He rose in rank to corporal and then sergeant, serving with the company until July 1865. Marion was the son of Robert and Sarah (Bates) Hopkins of Union County, Ohio. He married Catherine Celestine Conner (1848-1906) in November 1869. The first assignment of the 32nd Ohio was in western Virginia. In October 1861 it made a forward movement and led the advance of the army through the mountains and pines of that region by night against Greenbrier, and in December accompanied Gen. Milroy in his advance on Camp Alleghany. In his report Gen. Milroy complimented the regiment very highly on its gallantry and good conduct in its charge into the camp of the enemy. The loss of the regiment in this affair was 4 killed and 14 wounded, some severely. On the return from this expedition it was ordered to Beverly, where it remained the rest of that severe winter. At the battle of McDowell the following May the 32nd lost 6 killed and 53 wounded, some mortally, being the last regiment to leave the field. In Fremont’s pursuit of Jackson up the Shenandoah Valley the regiment bore its part, participating in the battles of Cross Keys and Port Republic. The regiment remained at Winchester doing garrison duty until 1 September 1862, the day the place was evacuated by Gen. White, when the regiment removed with the brigade to Harper’s Ferry and assisted in the defense of that place, but after making a hard fight and losing 150 of its number, the regiment, with the whole command, was surrendered by the commanding officer of the post as prisoners of war. The regiment was exchanged in January 1863, when it was sent South, moved with the army to Lake Providence, La., and during the campaign against Vicksburg took a prominent part in the gallant achievements of the 3d division, 17 corps. At the battle of Champion’s hill the regiment made a bayonet charge and captured the 1st Miss. Confederate battery — men, guns and horses — with a loss of 24 men. The total loss of the regiment during the campaign and siege of Vicksburg was 225, rank and file. It participated in the battles of Port Gibson, Raymond, Jackson and Champion’s Hill; was in the extreme front of Logan’s division when Vicksburg surrendered; was assigned to post duty under Gen. Logan; was also with Sherman in Feb., 1864, at Meridian, and lost 22 men at Clinton. Corporal Marion Hopkins was among the “more than three-fourths of the regiment” reenlisting as a veteran after three years service. Those who re-enlisted were sent home on “veteran furloughs” for thirty days. After their furloughs, the men reassembled in Columbus on 18 April 1864, were re-armed and re-equiped, and put on railroad cars to Cincinnati and then to Cairo, Illinois, where they were united with non-veterans. They left Cairo by the steamer Illinois on 27 April and were transported to Clifton, Tennessee on the 30th. They then marched overland to Huntsville, Alabama, reaching there on 20 May 1864. From there they marched with Sherman’s Army into Georgia. I take this the earliest opportunity to answer your letter that you sent by _____. It found me well as common. I got them boots and other things that you sent by him. The boots will do pretty well — little too heavy — and the vest is alright. It is very warm here for this time of the year. I expect that it is pretty cold up there by this time but it looks a little like rain today. That ____ cheese was very good. I soon may ____ with it as you may suppose. I suppose that the children are a going to school this winter. I would like to be there to go with them but as it is, I can not. But I am well enough satisfied here. Part of our regiment is a going for three years again. C. Smith put his name down for to go but I don’t think that he will stick very well. But I can’t see it yet. It is too big in my eye. I don’t think that they will get any [volunteers] in our company but there will be about half of the regiment go in again. But Co. B is too sharp for them — most all. Charley Smith has went in again. Mother, I have wrote all that I can think of this time and so I will close for this time hoping to hear from you all soon. Tell Asa that I will write to him in a few days. And so I close for this time. Direct to Second Brigade instead of 3rd Brigade. I once more take up my pen in hand to answer your letter of date December the 12th. It found me well as common and I hope ‘ere this reaches you it may find you the same. It was the letter that you sent them buttons in. They came through alright. We are still encamped in the same place that we was when I last wrote to you and I think that we will stay here all winter from all appearance. It is a very good place to stay in the winter but most too hot in the summer, We have not had any cold weather here yet this winter — neither very wet. I don’t think that we will have any. It is most too far south. Most of the boys feels pretty well today. We had three gills of whiskey issued to each of us this morning on the account of it being Christmas. Mother, I cannot think of anything more to write this time so I will close for this time hoping to hear from you soon. Lilly. Christmas Gift. What will you give me for getting your christmas gift? I will take a stick of candy if you will give it to me. Lilly, I suppose that you have grown so large that I would not know you if I should come soon, but when I come home I will fetch you something pretty and so goodbye, Lilly. Write soon. Well Andrew, how are you by this time? I suppose that you have got some more muskrats for sale. If you have, bring them to me and I will buy them of you. And I suppose that you are about as large as Uncle Archie. If you are, you could throw me down, couldn’t you. Andrew, goodbye for this time. I seat myself to write you a few lines to let you know that we arrived here alright. We got here today. We are going to stay here awhile — a month anyhow and if not longer. We have a very nice place to camp. It rained a little here today but I guess that it is all over with for this time. We have drawed new tents so we are fixed pretty comfortable. I am a _____ that box of provisions that I got a home but it is pretty near gone now. It came in pretty good play on the boat. Mother, I had to send back for some more money. I wanted to get me a pair of boots and one or two other things. I expect that we will get some more in a few days. Mother, I will not write a very long letter this time as it is a getting dark. So goodbye for this time. Once more I take my pen in hand to inform you all that I am well as common and I hope that these few lines may find you all the same. Mother, you must not look for a very long letter from me this time as we are under marching orders. We are now on the center of Sherman’s army. I think that we are going to the right of the line to try and flank old Hood out of the city of Atlanta. I hope that we will succeed in so doing and then perhaps we will get some rest. We had another man killed in our company. It [was] John [W.] Shirk. ¹ He was killed dead on the spot. He was shot through the head with a minié ball. That makes twenty-five that we have lost since we came on the line (that is, out of our company). Our company is getting to be very small. We only have thirty-five men by for duty. When we first came onto the line, we had eighty men so you can judge how this campaign has used up our company. But I think that I am good for it if it does not last too long. We still have a plenty to eat and wear so there is no doubt but what we will get along if Wheeler does not cut off our hardtack as he has been trying to do it near Dalton and he got whipped in the attempt. So I think that that there is no danger for the present. In your letter, you speak about Charles [E.] Smith [of Co. I] being a prisoner of war. He is not but his brother was taken on the 22nd. Charles S. is still well as common and in good spirits — or at least was when I last saw him and that was a day or two ago. It is very healthy here as a general thing. This is called the healthiest part of Georgia in and around Atlanta. We are within about one mile of town and gaining on it everyday but as we got orders to move, I suppose that we are a going to try another place. Suppose we will try and take the Macon Railroad as that is the only railroad that they have to get their supplies over now as all of their other roads are cut. 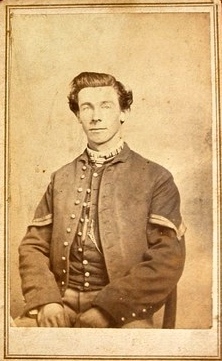 ¹ John W. Shirk (1841-1864) of Co. B, 32nd Ohio, was killed on 22 August 1864 in fighting before Atlanta. He is buried in the Marietta National Cemetery in Cobb county, Georgia. He was the son of Jonas and Olive (Harrington) Shirk of Union, Union county, Ohio. As this is a very nice day, I thought that I would try and write you a few lines to let you know that I am well as common and I hope that these few lines may find you all the same. Mother, I do not know what to write that will interest you but I will try and do the best I can. We expect to be paid this week and I will try and send you about $1.00 or more. Charles Hathaway owes me $25.50. I got a letter from him the other day and he told me that he would pay you soon. I was sorry to hear that [brother] Asa ¹ was sick in the hospital. I hope that he is home ‘ere this and well. If he is, tell him to write to me. I got a letter from him the other day. I would answer it if I was certain that he was at home. I suppose that you have saw Elias ‘ere this. if so, how does he look? Mother, we still have plenty to eat and wear so you see that we are a getting along fine and soon [we will] have a plenty of money. The last letter that I wrote to you, I told you that I wanted you to send me some paper and envelopes and a hat — a Burnside if you can get one. If Asa is at home, he knows what kind to get and if Capt. is not coming back right away, I think that you can send them by Dave McLoud. ² He lives at Mr. Bigelow’s. He is home on furlough now. And if he can bring anything else, you can send it. Send what you think best in the eating line or any other line that you think best. I have not had a letter from home for two or three weeks. I suppose it is on the account of the railroad being cut between here and Nashville but they have it repaired now so that the mail comes through alright now. Mother, we have a very nice camp here now and the very best of water, but we have not drawed our tent yet, but expect to in a few days. But we have plenty of gum blankets so you see that the rain can not hurt us in the least way. There is rumor in camp that the boys that was taken prisoner on the 22nd of July are it be exchanged this week and I think that there must be something in the rumor for there was a train of cars went out on the Macon Road loaded with rebel prisoners and the train came back in the night loaded with our men. But whether it was some of them or not, we will know against night. I hope that it was at any rate. Mother, I can not think of anything more to write that will interest you so I will close for this time hoping to hear from all of you soon and tell Mary to write a few words or Lewis. ¹ Asa George Hopkins (1846-1934) was Marion’s younger brother. Asa served in Co. D, 100th Ohio Infantry. ² David McLoud served in Co. B, 32nd Ohio Infantry. He entered the service as a private and mustered out as a corporal. ³ Lewis Hopkins (1849-1872) was Marion’s youngest brother.